Took this from an old ship before it went for scrap. Badly pitted from the salty air. Used to have a hickory handle, 14″ long. Have since replaced with a 19 hickory handle from GB. 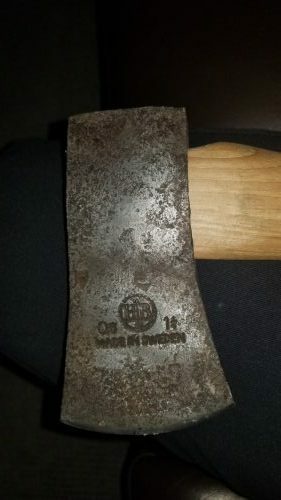 Appears to have a 1-1/4 lb hatchet head, and some other barely distinguishable letters on the other side of the logo. Not an old axe but the patina tells a story. Thanks for sharing!